Hands is an unforgettable story from Anderson's signature collection, Winesburg, Ohio (1919). In the presence of George Willard, Wing Biddlebaum, who for twenty years had been the town mystery, lost something of his timidity, and his shadowy personality, submerged in a sea of doubts, came forth to look at the world. With the young reporter at his side, he ventured in the light of day into Main Street or strode up and down on the rickety front porch of his own house, talking excitedly. The voice that had been low and trembling became shrill and loud. The bent figure straightened. With a kind of wriggle, like a fish returned to the brook by the fisherman, Biddlebaum the silent began to talk, striving to put into words the ideas that had been accumulated by his mind during long years of silence. Adolph Myers was meant by nature to be a teacher of youth. He was one of those rare, little-understood men who rule by a power so gentle that it passes as a lovable weakness. In their feeling for the boys under their charge such men are not unlike the finer sort of women in their love of men. And yet that is but crudely stated. It needs the poet there. With the boys of his school, Adolph Myers had walked in the evening or had sat talking until dusk upon the schoolhouse steps lost in a kind of dream. Here and there went his hands, caressing the shoulders of the boys, playing about the tousled heads. As he talked his voice became soft and musical. There was a caress in that also. In a way the voice and the hands, the stroking of the shoulders and the touching of the hair were a part of the schoolmaster's effort to carry a dream into the young minds. By the caress that was in his fingers he expressed himself. He was one of those men in whom the force that creates life is diffused, not centralized. Under the caress of his hands doubt and disbelief went out of the minds of the boys and they began also to dream. And then the tragedy. A half-witted boy of the school became enamored of the young master. In his bed at night he imagined unspeakable things and in the morning went forth to tell his dreams as facts. Strange, hideous accusations fell from his loose-hung lips. Through the Pennsylvania town went a shiver. Hidden, shadowy doubts that had been in men's minds concerning Adolph Myers were galvanized into beliefs. One afternoon a man of the town, Henry Bradford, who kept a saloon, came to the schoolhouse door. Calling Adolph Myers into the school yard he began to beat him with his fists. As his hard knuckles beat down into the frightened face of the schoolmaster, his wrath became more and more terrible. Screaming with dismay, the children ran here and there like disturbed insects. "I'll teach you to put your hands on my boy, you beast," roared the saloon keeper, who, tired of beating the master, had begun to kick him about the yard. For twenty years Adolph Myers had lived alone in Winesburg. He was but forty but looked sixty- five. The name of Biddlebaum he got from a box of goods seen at a freight station as he hurried through an eastern Ohio town. He had an aunt in Winesburg, a black-toothed old woman who raised chickens, and with her he lived until she died. 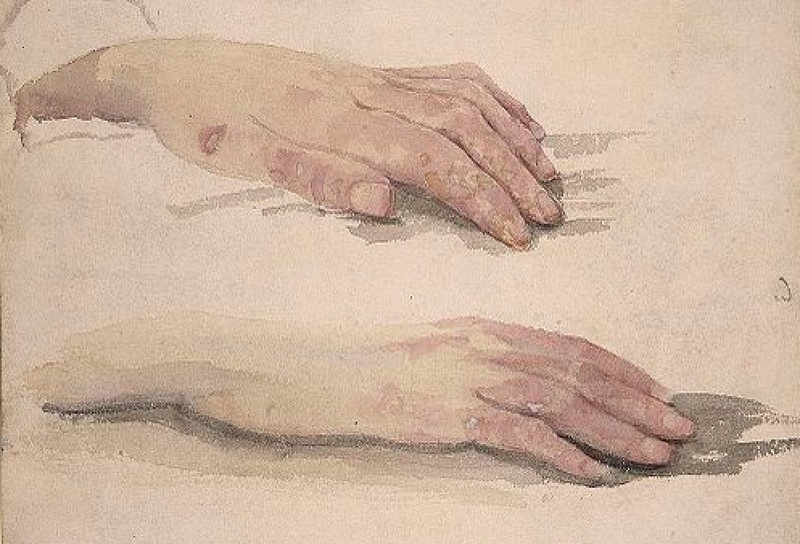 He had been ill for a year after the experience in Pennsylvania, and after his recovery worked as a day laborer in the fields, going timidly about and striving to conceal his hands. Although he did not understand what had happened he felt that the hands must be to blame. Again and again the fathers of the boys had talked of the hands. "Keep your hands to yourself," the saloon keeper had roared, dancing, with fury in the schoolhouse yard. Enjoy more stories from Winesburg, Ohio. Add Hands to your own personal library.